The trucking profession is sedentary, with long periods of time on the road that can lead to weight gain. Excess weight can lead to a host of health problems such as heart disease, hypertension and diabetes. These conditions are not only deadly, but can cause a truck driver to lose his license: The Federal Motor Safety Commission requires medical evaluations that indicate no history of cardiovascular disease, high blood pressure or diabetes that can impair driving ability. Eat fewer calories. Weight gain occurs when you eat more calories than you burn. Consuming fewer calories will allow your body to burn the excess fat for energy and help you lose weight. But eat enough calories to sustain your health. Consume at least 1,500 calories if you're a woman and 1,800 calories if you're a man. Pack healthy meals and snacks. It's difficult and expensive to eat well while on the road. Pack meals and snacks with low-fat cheese, whole grain bread or crackers, fruits, vegetables and nuts, which will provide you with energy, help you lose weight and cost less than eating out. Make healthy choices when dining out. Instead of hamburgers and other fattening foods, order grilled lean meats, steamed vegetables and salads with low-fat dressing. Avoid foods that are fried or breaded. Exercise during pit stops. Eating fewer calories can lead to weight loss, but adding exercise speeds up the process and provides additional health benefits, such as strengthening your heart. The American Heart Association recommends at least 30 minutes of exercise five days a week; however, the 30 minutes can be split into shorter increments. During each rest stop or break, take 10 minutes to walk briskly or do plyometrics exercises such as squats and jumping jacks. If you do that three times a day, you'll get your recommended 30 minutes of exercise. 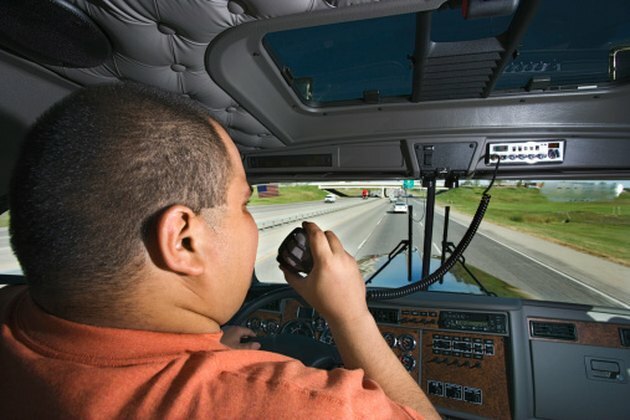 Federal Motor Carrier Safety Association: Part 391.41: Physical qualifications for drivers.